The newest Marvel title, Spider-Man, is finally out and that means it is time to start swinging around tall buildings and beating up baddies. Before you do either of those things, you may be curious in knowing how to get at the DLC items you get for preordering the game. Below I will walk you through how to access Spider-Man DLC items. Note: Before you can access any of the preorder items in Spider-Man, you must first playthrough the Fisk Tower tutorial mission (The Main Event). After you complete the tutorial mission you will need to complete the My OTHER Other Job mission. After that mission is complete, complete the Keeping the Peace mission for Capt. Watanabe. The final mission you need to complete is called Something Old, Something New. Once all four missions are complete you will gain access to your DLC items (Suits). Where are the Spidey Suit Pack DLC Items? 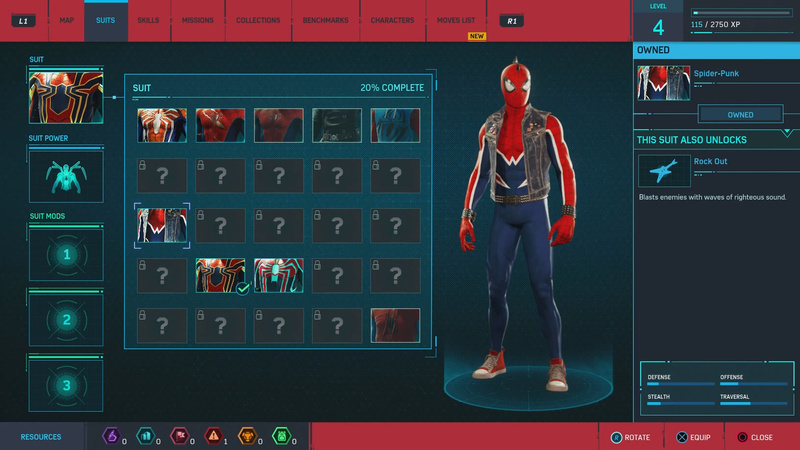 Spider Punk outfit is one of three preorder suits you will receive. Iron Spider suit is on of three outfits you receive for preordering the game. Velocity Suit is one of three preorder suits you will receive. Velocity Suit: This suit unlocks Blitz (Suit Power) which allows for faster sprinting and better enemy knock downs. Spider-Punk: This suit unlocks Rock Out (Suit Power) which blasts enemies with waves of sound. Iron Spider Suit: This suit unlocks Iron Arms (Suit Power) which causes Spider-man to have four articulated arms. To access your new Spider-Man suits, your need to complete the mission up to Something Old, Something New. Once you’ve done this, a new tab appears in the menu which allows you to select suits on the fly. To change into your suits, navigate to the Suits tab and select whichever suit you wish to wear. Where is the Spider-Drone Gadget? The Spider-Drone Gadget is craftable at level 8. 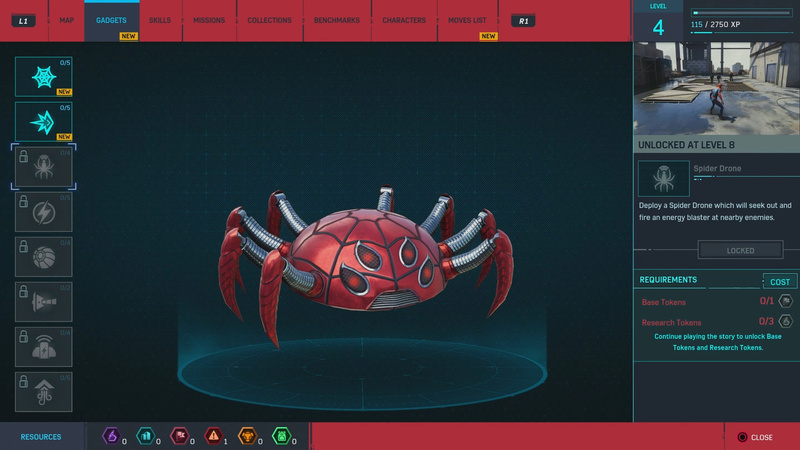 The Spider-Drone gadget is accessible at Level 8 (requires one Base Tokens and three Research Tokens to build). You will gain access to crafting Gadgets by starting the Fisk Hideout mission. Once this mission is started, a new Gadgets tab will be added to your menu. Navigate to this tab and craft whichever gadgets you want to craft, including the Spider-Drone. How to Use the 5 Extra Skill Points? When you access the Skills menu for the first time in Spider-Man you will receive your five bonus Skill Points. After you complete the mission The Main Event (first tutorial mission), you will get access to the Skills menu. 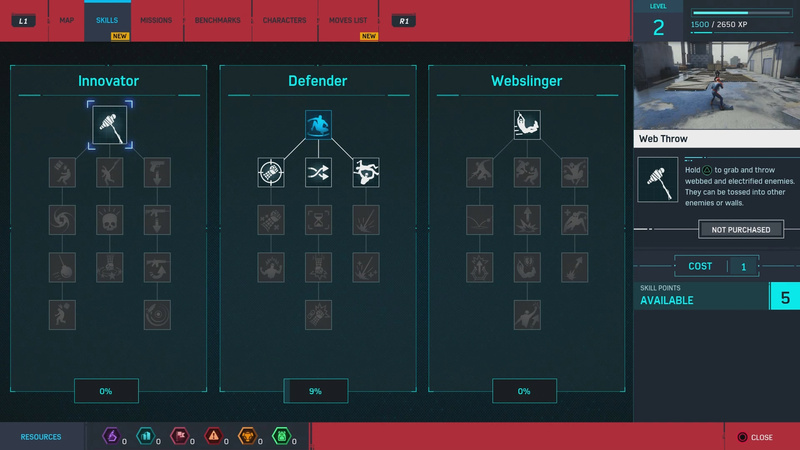 In this menu you can level up Spider-Man in three categories: Innovator, Defender, and Webslinger. When you first access the Skills menu you will gain one skill point for completing the opening mission as well as five extra skill points for preordering the game. To spend the skill points, navigate to the Skills tab in the menu and select the desired skill you want then hold down the X button until it’s purchased. 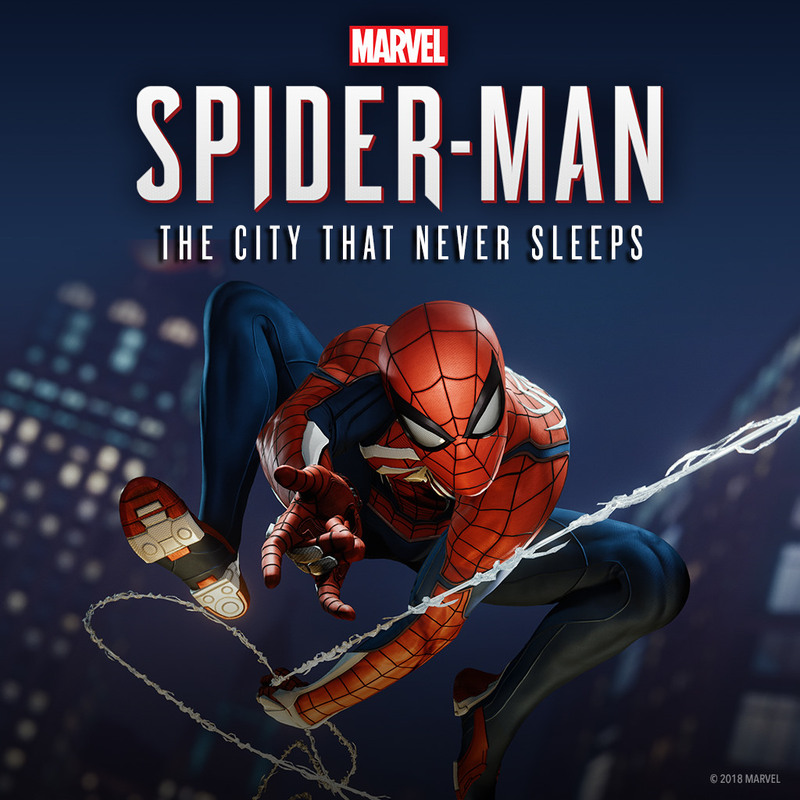 The DLC story for Spider-Man is called The City That Never Sleeps. Moar: Get an unlisted Spider-Man Suit with our guide. Thoughts on my how to access Spider-Man DLC items post? Let me hear them in The Pit below. I put in the code after doing all the main missions and downloaded the code in the redeem code area and installed the dlc I went into the game and went to dlc and pressed on the heist and it put me in the PlayStation store and said I need to buy it PLS HELP ! Help all! I preordered the deluxe Spiderman ps4 game from speedygifts.co.uk for my sons birthday next week. The game arrived fine but today I got an email advising speedygifts supplier cannot provide DLC codes. Knowing nothing about gaming, is the game now unuseable? Should I return it and buy it somewhere else? Will my son be disappointed if there’s no code? Please help – any advice welcomed! Game will work but it wont have any added content and considering you sent as posted on the psn is 99.99 I would totally get for your money back and just buy the digital deluxe online. I pre-ordered the Deluxe Version and just 100% the game but I still don’t have access to the bonus missions that come with it. Anyone have any ideas? I bought the digital deluxe version of the game at GameStop and there were two different codes Ihad to input. One was for the game itself. One was for the extra bonus preorder content and I realized that only after I had played through the game and inuouted the bonus content code while in the middle of the game. I haven’t played since but next time I start up the game I’ll check to see if my content was added. As of now the preorder avatar for the ps profile worked so the rest should have worked as well. I’ll try and keep things updated. When you originally pre-ordered the game (from wherever) that promised you the DLC, you would have received a code. — if you ordered online, then you probably got an email in the last day or so, just before release. (If you didnt, check your junk or spam folders) — Regardless how you got it, you need that DLC code. Input that code in the Playstation store “Redeem Codes” section (either on your PS4 or on the website). This will download the DLC items and unlock the items in the game. im also having that problem i just downloaded the dlc from the ps store and i still can’t acess the suits and didn’t revive my points, anyone suggestions? Input the codes in ps store redeem section. Still not able to access my pre order bonuses. I bought the game at Gamestop and can’t find where I put the code in. Any help would be hugely appreciated! Have you downloaded day 1 patch? I can’t access my suits either and I completed the 4 missions required. Help please!!! Have you tried inputting the code in the redeem code section on the PS Store? I got the digital version, so I probably won’t be much help. What does everyone think of Spider-Man so far?